Use these cardboard boxes as gift boxes; they're perfect for a baby shower gift, to hold a birthday present or filled with recipe cards and spices as a housewarming gift. The recipient will be getting two gifts in one-the box can be displayed in a nursery to store baby supplies and clothing or to keep papers and supplies organized in an office. ADD FEMININE STORAGE TO ANY ROOM - Colorful cardboard boxes are ideal for multiple storage needs. They can hold scarves and trinkets in a closet, receipts in an office, flowers in the family room or hair accessories in the bathroom. They're wonderful for keeping mementos such as postcards, photos and greeting cards safe and the perfect catch-all for all those odds and ends you want to keep off the dresser or counter. The options are endless. DECORATIVE AS WELL AS FUNCTIONAL - These stylish cardboard boxes, with their lovely floral design, are perfect for decorating. Stack them on an office shelf, store items in the entrance or display them open with candles or dried flowers. They are unique photo props and would make a wonderful table display at a craft show. 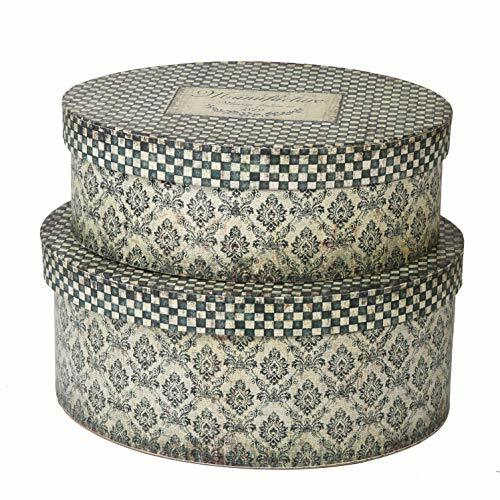 Each box features an eye-catching floral pattern and checkerboard lid. MAKES A WONDERFUL GIFT BOX - Use these cardboard boxes as gift boxes; they're perfect for a baby shower gift, to hold a birthday present or filled with recipe cards and spices as a housewarming gift. The recipient will be getting two gifts in one-the box can be displayed in a nursery to store baby supplies and clothing or to keep papers and supplies organized in an office. DURABLE CARDBOARD CONSTRUCTION - Sturdy cardboard boxes are made to withstand regular use. Designed using durable materials, these boxes are solid and strong, and can nest within each other for easy portability. They also look fabulous stacked.